Tucked away in Caledonia State Park is quaint Totem Pole Playhouse, one of the areas few classic summer theaters. Totem Pole Playhouse hosts plays and musicals throughout the summer, and most years, has a special Christmas show for the holiday season. The theater has been in business for over sixty years, keeping its own company of actors and also showcasing famous actors and actresses, including John Ritter, Patsy Cline and Sally Struthers. 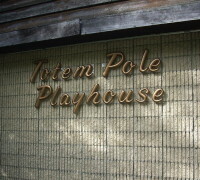 Totem Pole Playhouse aims to bring nationally acclaimed, off-Broadway hits to its lovely and especially intimate venue. The Playhouse is one the few theaters to maintain its longevity, providing classic theater for the central Pennsylvania area, despite being a nonprofit organization. Snacks and beverages are available for purchase. Subscriptions are available, offering a 10% discount to those who renew their memberships.